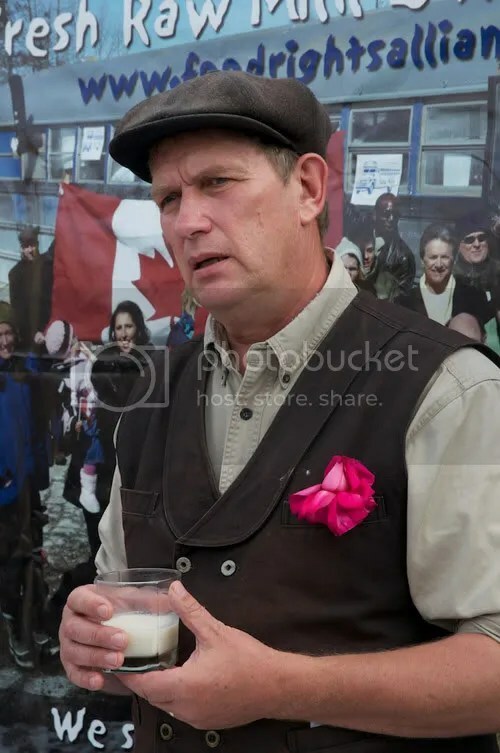 “Farmer and raw-milk crusader Michael Schmidt has launched another hunger strike in his nearly five-year legal battle to make Ontario the only province to legalize the sale of unpasteurized milk. The move comes after the Ontario Court of Justice on Wednesday found Schmidt guilty of selling and distributing raw milk and raw-milk products. In a 77-page decision, Ontario Justice Peter Tetley convicted Schmidt of 15 of the 19 criminal offences charged under the province’s Health Protection and Promotion Act and the Milk Act. Raw milk farmer Michael Schmidt of "Glencolton Farms" and "Our Cows" cowshares, with Alice Jongerden, former agister of "Home on the Range" cowshare in Chilliwack, B.C. Photograph from the Vancouver Sun. 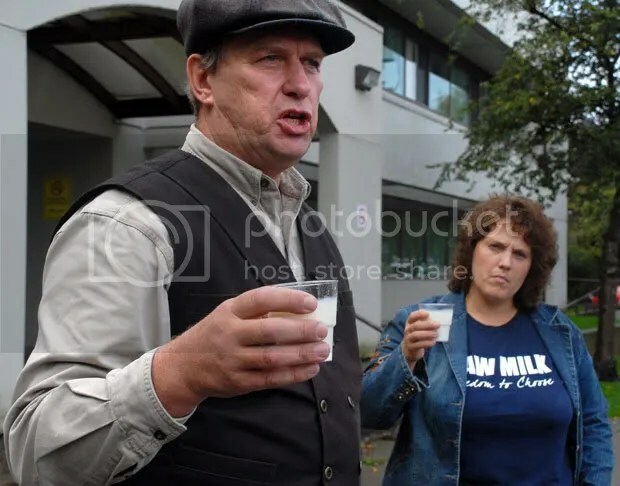 Photo was taken at a raw milk "drink in" outside the offices of Fraser Health. 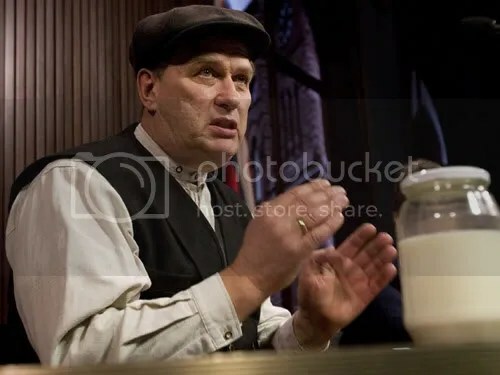 “TORONTO — The Ontario Court of Justice on Wednesday found rural dairy farmer Michael Schmidt guilty of selling and distributing raw milk and raw-milk products — the latest development in a nearly five-year legal battle with the province about consumers’ rights to the illicit liquid. 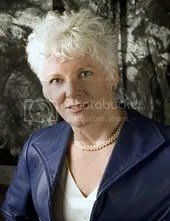 In a 77-page decision, Ontario Justice Peter Tetley convicted Schmidt of 15 of the 19 criminal offences charged under the province’s Health Protection and Promotion Act and the Milk Act. “It’s not really about me,” said Schmidt at his 100-acre farm in Durham, Ont., shortly after receiving the ruling late Wednesday. “Durham dairy farmer Michael Schmidt was found guilty of selling and distributing raw milk on Wednesday, a decision that overturned his 2010 acquittal. 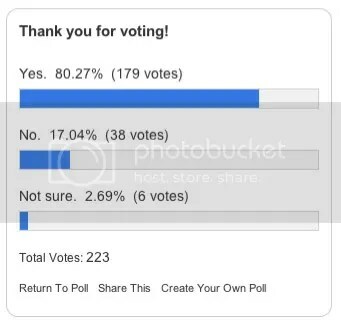 The same poll, but 10 hours later. 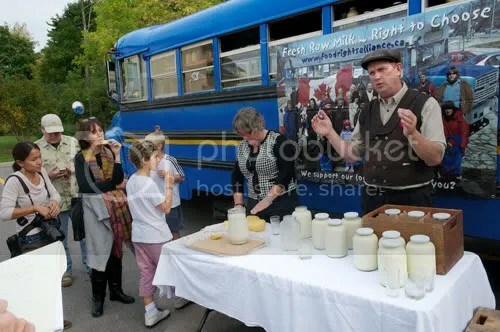 Michael Schmidt talks to reporters at a news conference September 27th in Thornhill, at the raw milk blue bus. “While expressing sympathy for the arguments of raw milk drinkers and producers, an Ontario appeals judge has nonetheless reversed Michael Schmidt’s exoneration nearly two years ago on charges of violating the province’s dairy laws. It’s even conceivable, the judge said, that Schmidt could be jailed. 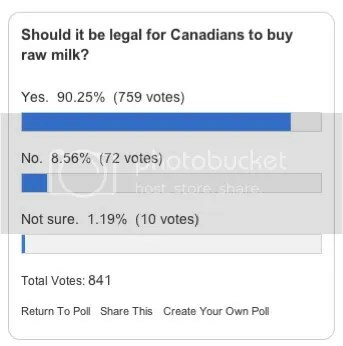 In the judge’s opinion, the legislature made a rational decision to ban the sale and distribution of raw milk, even if it might have discriminated against consumers who want raw milk. .